Early eighteenth-century North America was an exotic place for British naturalists to explore. Regular links between London and the New World meant all manner of natural history treasures were being brought back to London. Mark Catesby (?1682-1749) was one of many naturalists who sent objects from North America to Europe. The Englishman Mark Catesby made his first visit to North America between 1712 and 1715 and resided mainly in Virginia. During his stay he collected natural history objects and developed a reputation that convinced a powerful cartel of British naturalists to sponsor his subsequent explorations between 1722 and 1726. Catesby is best known for the illustrations, which resulted from these explorations, in his two-volume Natural History of Carolina, Florida and the Bahama Islands (1729, 1747). Catesby's supporters included the Royal physician Sir Hans Sloane (1660-1753), whose collection eventually founded the British Museum, the diplomat William Sherard (1659-1728) and Charles Du Bois (1656-1740), Treasurer of the East India Company. 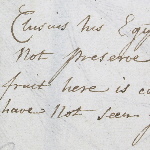 In return for their financial support, Catesby sent them plant specimens to add to their herbaria. Today, the Sloane Herbarium is housed in the Natural History Museum, London, whilst the herbaria of Sherard and Du Bois are housed in Oxford University Herbaria. 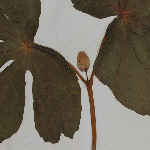 Following a search of all the pre-1796 herbaria housed in Oxford (c. 60,000 specimens), all of the specimens bearing Catesby's name or likely to have been collected by him have been gathered into a single database. These specimens are spread across three pre-1796 herbaria. The Sherard Herbarium was amassed by Sherard and bequeathed to the University in 1728. The herbarium was part of Sherard's grand plan to publish a list of all of the world's known plants. When Sherard died his herbarium, which comprised some 12,000 sheets, was the largest and most celebrated in Europe. Over the next century it continued to grow as the Sherardian Professors of Botany added material, making the collection the de facto general herbarium of the University. 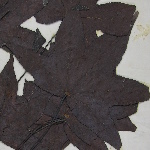 Today, the Sherard Herbarium comprises about 21,000 specimens. Numerous collectors, including John Bartram (1699-1777), John Clayton (1686-1773), William Clerk (fl. 1710-1734), William Houstoun (1695-1733), John Mitchell (d. 1768), Thomas More (fl. 1700-1730) and Michel Sarrazin (1659-1734), contributed to the North American specimens. Three hundred and forty eight specimens bear Catesby's name and are localised to: Virginia (2, possibly 3, specimens); Carolina (65, possibly 66, specimens); South Carolina (178 specimens); and Providence (30 specimens). Seventy one specimens are unlocalised. The Herbarium also contains specimens of cultivated plants, usually raised at Eltham Palace, the home of Sherard's brother, James (1666-1737), from seeds collected by Catesby. The German-American botanist Friedrich Traugott Pursh (1774-1820) visited Oxford as he was completing his magnum opus Flora Americae Septentrionalis; or, a systematic arrangement of the plants of North America (1814). He considered Sherard's herbarium 'the most complete collection of North American plants now extant' (Pursh, 1814: p.xviii) and specifically cited 11 Catesby specimens. Part of the Dillenian Herbarium was separated from the Sherard Herbarium in the late-nineteenth century by George Claridge Druce (1850-1932). 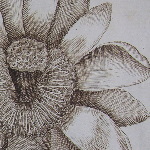 Druce separated those specimens he considered to have been grown at Eltham Palace and used in the production of the plates for Johann Dillenius's (1684-1747) Hortus Elthamensis (1732). However, the decisions Druce made were flawed since wild-collected specimens were included and some specimens were collected much earlier than the publication date of the Hortus. 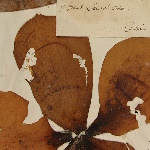 Thirty four specimens in the Dillenian Herbarium are associated with Catesby, or places he could have collected. The Du Bois Herbarium was created by Charles Du Bois and apparently given to the University during Humphrey Sibthorp's (1712-1797) tenure as Professor. The herbarium comprises some 13,000 specimens, and was originally bound in 74 elephant folio volumes and arranged according to John Ray's (1627-1705) Historia Plantarum (1686, 1688, 1704). The Du Bois Herbarium was unbound, remounted and organised into its present form by Druce on the orders of Isaac Bayley Balfour (1853-1922) in the 1880s. The main collectors who contributed North American specimens were David Krieg (d.1713) and William Vernon (fl. 1688-1711), who collected in Maryland, and an unknown person who collected around Hudson Bay. Four hundred and fifty eight specimens bearing Catesby's name are localised as: Virginia (32 specimens); Carolina (3 specimens); and South Carolina (412 specimens). Eleven specimens bearing Catesby's name are unlocalised. Some of the American collections have been studied but generally the Du Bois's Herbarium has been the subject of little research. 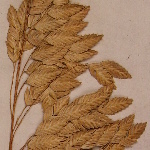 Pursh makes no mention of the Du Bois Herbarium when he visited England (1811-1815) and worked in London and Oxford. (i) Sherard habitually relabelled specimens in his own hand and discarded original labels. Many of the specimens are mounted on pre-nineteenth-century paper but it remains unclear precisely when the specimens were mounted. Numbers in red on the Sherard sheets were added by William Baxter in the late-1840s. Continent location stamps appear were added towards the end of the nineteenth century but must be taken as guidance only; there are numerous cases where the stamps do not match likely places of specimen collection. The Sherard Herbarium was reordered by Dillenius; Druce introduced the present order. (ii) The original order and contextual information was lost when the Du Bois Herbarium was unbound. This searchable database comprises all of the specimens collected by Mark Catesby which are known iin Oxford University Herbaria. Users should note that information provided has been transcribed from labels and no attempts have been made to check identifications given on the sheets.